So, what do you know. I made some fish stock yesterday, and it was quickly decided, in consultation with the Sheriff, that I would make some New England Clam Chowder today. It was also suggested by said Sheriff that the chowder be served with oyster crackers and sourdough bread. First, cut the bacon strips into pieces, and then slowly heat in a Dutch oven or other pan, over a small to medium heat. After the fat has rendered, remove the bacon pieces to use as a topping later, and then add the chopped onions. The onions should slowly cook in the bacon fat for about 5-10 minutes, until cooked through but not browned. Some people cook the onions with the lid on. Next, stir in the flour* and cook, stirring, for about 3 minutes. Then, add the fish stock, clam juice as well as the juices from the canned clams, stirring to remove any lumps. Next, add the diced potatoes and celery, if any, and then after bringing the liquid to a boil, reduce the heat and then simmer until the potatoes are cooked through, about 15 minutes. Lower the heat substantially, and then stir in the clams themselves and the half/half. Allow this to heat up, but DO NOT bring to a boil. Then, add salt and pepper to taste, while continuing to let the chowder simmer. The longer you let the chowder get thicker, the better. Then, serve with oyster crackers and/or sourdough bread, and top with your favorite add-ons. *One recipe called for the flour to be mixed in with the half and half first, before mixing into the chowder. Perhaps I’ll try that next time, because at that stage, it’ll be easier to gauge how much thickening the chowder needs, rather than nearly at the beginning. -To improve the chowder next time, I should use a richer fish stock (perhaps creating the stock from more than two fish heads) and use less celery. I was also considering adding some sour cream and/or white wine to the chowder, to give it a little tangy-ness and oomph. -Wednesday, June 29, 2011: Also, ate some kale cooked with fresh corn (kale takes a little longer to cook – just add some oil, throw in the kale, and add about a cup of water, and steam for about 5-10 minutes; top with cold-pressed olive oil and some salt and pepper and some lemon juice). Later, S and I had blueberry yogurt popsicles – delicious, but apparently stainless steel (not plastic) popsicle molds are the way to go. 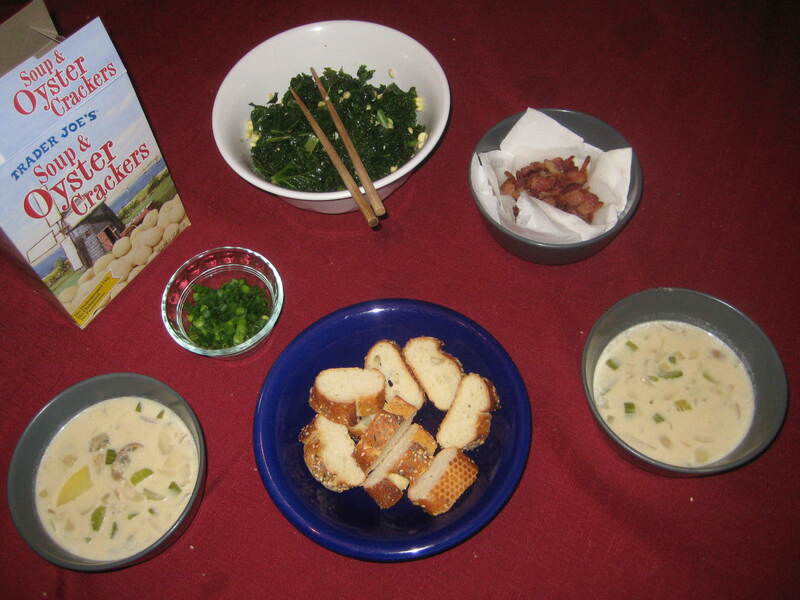 This entry was posted in Main Dish, Recipes and tagged Chowdah, Clam Chowder, Fish Stock. Bookmark the permalink. Who might this Sheriff be? I can’t imagine.